After a period of uncertainty, a winner finally emerges. Abdullah Yaamin, a conservative candidate related to former autocratic ruler Maumoon Abdul Gayoom, is the new president of the Maldives. The development brings to an end the looming political uncertainty that has been plaguing the archipelago for the last three months. In the run-off vote, Yaamin won 51.3 percent of the vote while his opponent, former president Mohamed Nasheed's Maldivian Democratic Party (MDP), received 48.6 percent. In the first round of elections held earlier this month, the MDP polled in at 46 percent while Yaamin's Progressive Party of Maldives (PPD) secured 30 percent. 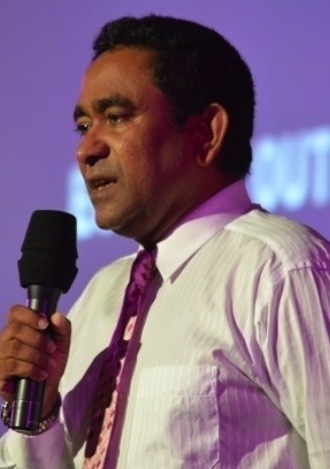 The third contender, Gasim Ibrahim, a businessman, managed just 24 percent. The difference between the first round and the run-off is stark, but in the former, Nasheed's opponents put forth a concentrated front against the former president, who had become the first democratically elected leader of the archipelago in 2008 after defeating Maumon Abdul Gayoom – an autocrat who had been ruling the country for 30 years. The Maldives' nascent democracy suffered a major jolt in 2012 when Nasheed was removed from his post, creating political uncertainty in this strategically significant archipelago. The decision was controversial and is considered a coup by the MDP leader. Since September this year, there have been three attempts to conduct elections. In the first vote on September 7, Nasheed secured 45 percent of the vote but the Supreme Court annulled the result and cancelled the second run-off vote after it found some irregularities in the elections. However, independent observers and the general public had generally found the poll free and fair. The Election Commission of Maldives has certified the most recent election results and even former president Nasheed has accepted the verdict. Despite these initial encouraging signals, questions abound regarding the political stability of the young democracy. Commenting on recent political developments in an interview with The Diplomat, the chief editor of Dhi TV, a local television channel, said "the political situation will stabilize only after the parliamentary elections, due in January or February next year. A government's stability depends on the strength of the party in the lower house." However, he feels that "with the election of a new president, the political vacuum and constitutional crisis facing the country has disappeared." But the challenges before the country have risen. On the one hand the country faces the daunting task of reviving its sagging economy and reinvigorating its tourism industry, which generates 30 percent of the country's revenue. On the other hand, the island nation is faced with increasing religious conservatism and growing support for political Islam. However, the Dhi TV editor says that “Islamic radicalism is not an issue in the country. But, for sure, the new government will not be as pro-West as the previous regime had been. It will rather focus on strengthening ties with India and Gulf states." Despite this, the very fact that conservative forces came together to thwart the march of the secular movement led by the MDP signals a simmering tension in the archipelago between secular and religious parties. India, which sees the Maldives as part of its sphere of influence and has a very strong strategic interest in the island nation, is sure to be relieved after the elections. Political uncertainty has been a matter of concern in this crucial archipelago. New Delhi does not want the island nation to become a bastion of political Islam and religious extremism. The South Asian democracy is also wary of growing Chinese interests in the island nation. Delhi-based political analyst Dipanjan says that "for India it is a matter of satisfaction that the political vacuum has come to an end. The popular perception is that New Delhi has been promoting Nasheed, but the biggest democracy knows how to play its cards well. It does not have any permanent friends or foes in Male; it has only permanent interests."